Biostratigraphic studies of the Niagaran inter-reef formations in northeastern Illinois. Springfield: State of Illinois, Department of Registration and Education, Division of the Illinois State Museum, 1948. Scientific papers of the Illinois State Museum, volume 4. Along the road, I noticed scattered Silurian limestone, roughly cut into large stones. They were dumped from a local quarry in northern Indiana; there was always a chance for a fossil missing complete and utter destruction in the quarry’s cruel crusher. Within minutes, a pleurotomariacean caught my eye, a beautiful, large marine gastropod. 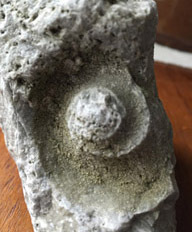 The fossil mold preserved details of its ancient ornamental whorls. 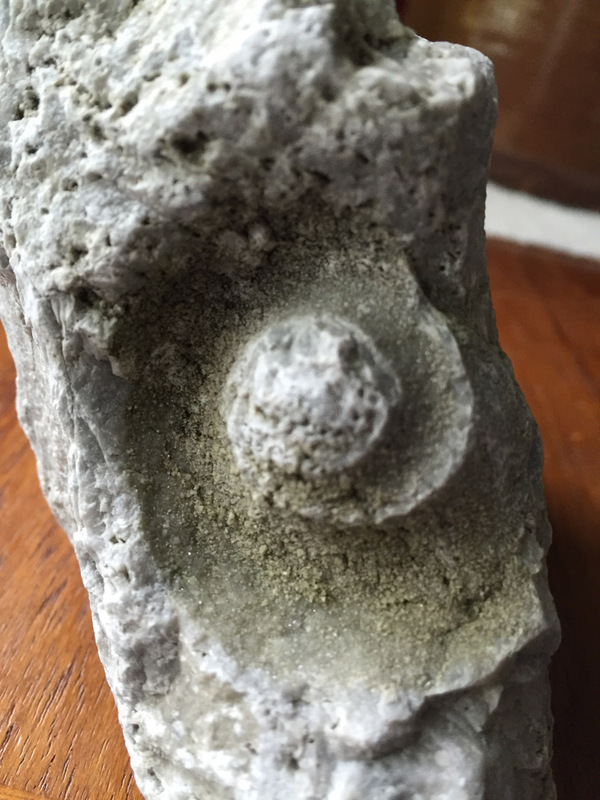 I stared at my discovery, and thought of all of my years tramping about Silurian reefs, searching for elusive trilobites, crinoids, cystoids, brachiopods, orthocone nautiloids, and pelecypods. Snails were never very common, so I was happy to locate a specimen by such perverse serendipity. I learned much about the Silurian from James Hall (1811–1898), New York’s predominant paleontologist in the nineteenth century, and Heinz Lowenstam, who modernized our understanding of Silurian faunas with his magnificent studies of the reefs in the Chicago area. Most important to me among Dr. Lowenstam’s opera is Biostratigraphic studies of the Niagaran inter-reef formations in northeastern Illinois. 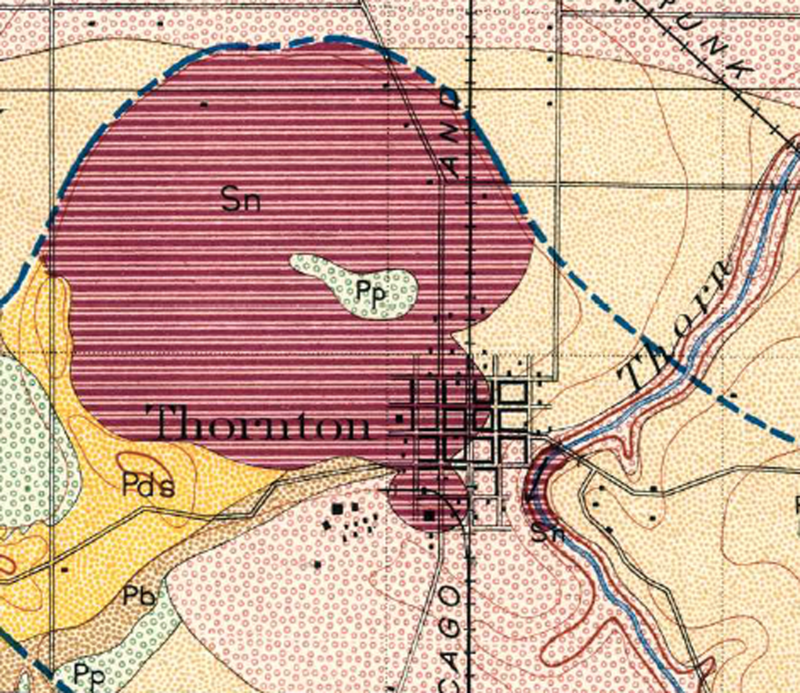 I read, re-read, and re-read Biostratigraphic studies many times, pouring over its text and illustrations to understand what I was seeing in the field around the Thornton (Illinois) quarry. I would collect fossils in the Brown Derby limestone flats, named after a neighboring restaurant and watering hole, west of the quarry proper. The reef limestone was exposed right at the surface, with fossils weathering out as molds or casts. With ease, I could spot brachiopods, coral, and cephalopods here, and with diligence, cystoids, crinoids, trilobites, and gastropods. Not far away, an outcrop of limestone was exposed on the east-bound entrance ramp at Halsted Street to Interstate 80, where I would pick up many of the same fossils as at the Brown Derby flats — before State Police patrols chased me away. I had other printed works to provide help on these expeditions — a field guide to a trip to Thornton quarry led by Dr. Lowenstam in 1956, J. Harlen Bretz’s first part of his Geology of the Chicago region (1939), and Stuart Weller’s magnificent Paleontology of the Niagaran limestone in the Chicago area (in two parts, Crinoidea published in 1900 and Trilobita appearing in 1907). 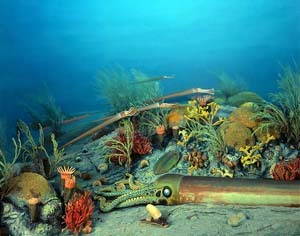 I eventually discovered at the Field Museum Eugene Richardson’s imaginative diorama of the Silurian reef, with which I spent countless hours on the second floor near the southwest corner. In the Museum’s library, I unearthed the Journal of Geology’s reef issue for July 1950, with Heinz Lowenstam’s paper “Niagaran reefs of the Chicago area” (pp. 430–487) as well as his paper in the Treatise on Marine Ecology and Paleoecology (1957), “Niagaran reefs of the Great Lakes area” (volume 2, pp. 215–248). In 1975, I was fortunate to meet Dr. Lowenstam at a scientific meeting, the first Miami conference on isotope climatology and paleoclimatology, on a red-letter day for me, Monday, November 17. At a coffee break, I introduced myself and babbled unremittingly about his work being a guide to my field trips around the Thornton reef, especially Biostratigraphic studies. I must have struck him as exceedingly weird! When I finally stopped to catch my breath, Dr. Lowenstam asked me if I ever read comic books, instead of pouring over Biostratigraphic studies. I said sure, my brother, sister, and I digested comic books with gusto — although we were banned from reading Wonder Woman, because of her costume. But we adored Biostratigraphic studies so much, that I guessed we had memorized it from first page to last. All Dr. Lowenstam could do was laugh! Biostratigraphic studies has an interesting history in itself. Published in 1948, this publication is still in print, available for all of two dollars from the Illinois State Museum in Springfield (visit http://www.museum.state.il.us/publications/). It exists in two physical states, in red cloth (out of print) and paper, with purple flexible covers (still in print). I collect copies of Biostratigraphic studies — but especially value those that are worn and annotated. My most significant copy of Biostratigraphic studies belonged to Eugene Richardson, Curator of Fossil Invertebrates at the Field Museum, and creator of my favorite Silurian reef diorama. The purple cover is torn, loose from the spine, with Dr. Richardson’s tell-tale bookplate pasted on the inside front cover. 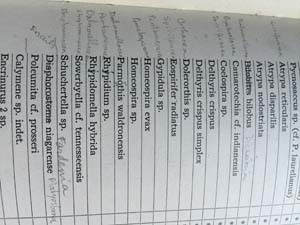 Annotations in Biostratigraphic studies start on p. 3 (table of contents) and continue to the very last blank page. This work obviously was well studied, with markings in black pencil, red pencil, blue ink, and black ink. Many of these marks correct typographic errors or printing mistakes. Other notes in the margins summarize or reference the printed text. 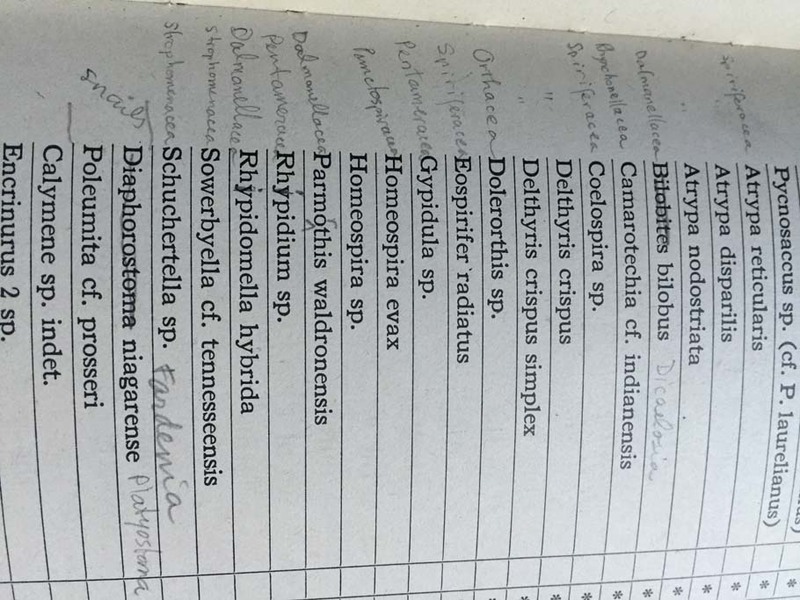 There are corrections of generic or species names, plus a column added to a table, and changes to citations. Thanks to Dr. Richardson’s well-studied copy, I re-read Biostratigraphic studies with a more critical eye, embarrassed that I didn’t spot, in my youthful enthusiasm, any of the typos and errors. Richardson’s marginalia forced me to think more objectively about some of Lowenstam’s sweeping interpretations. On p. 98, Lowenstam described the fossilization of sponges, in part, in the following way: “During the course of gravity settling the prolific sponge element formed a narrow meshed layer that functioned like a pressed-down screen. The resulting effect on the underlying burial belt was condensation of the fossil content in response to the resultant vertical compression, this reversing the vertical dispersal effect of the initial burial phase.” Along the blank edge, in pencil, Richardson wrote in his neat script: “The sponge spicules remaining together shows persistence of the soft tissues, which were the only device to hold the spicules in the shape of the body. But a sponge with the soft tissues intact would not act like a pressed-down screen.” (emphasis in original) I collected many of these sponges along cuts in the dipping limestone on the east edge of the Interstate 80 Halsted entrance ramp, so I knew by experience that Richardson’s diagnosis was accurate. 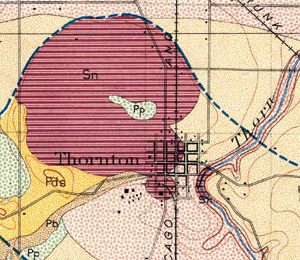 The section on Thornton quarry in Biostratigraphic studies starts on p. 129. This text helped me understand reef and inter-reef deposits in my sampling by foot and bicycle, cloth bags stuffed with specimens. Lowenstam’s analysis dispelled, once and for all, ancient notions of northern and southern faunal provinces, invented by Charles Schuchert (1858–1942) and Edward Ulrich (1857–1944) meditating in their offices on obtruse ways to explain away ecological differences. In turn, Lowenstam’s writings and Richardson’s diorama at the Field Museum fueled my prehistoric reef walking — and continue to sustain my search for Silurian fossils to this day. Richardson’s annotations helped me read Biostratigraphic studies more objectively — place my trust in field work over printed explanations, even those by personal deities.